The AhA effect to bring new career opportunities • BTC d.d. There is a growing number of educated young people who do not get their well deserved opportunity to work. Thus, full of ideas and innovativeness, they decide to try their luck abroad. We are not aware enough of the importance of new knowledge, innovations, and constant development of technologies, created and possessed by young people. Intergenerational cooperation has never before been as important as it is in the age of constant development of new technologies. Therefore, it is even more important to encourage and motivate young people and help them in their development and on their professional paths. Connecting, cooperating and innovating are last but not least the only elements that enable the constant development and progress of our society. One of the programmes, which is in its entirety intended for young people and their professional development, is the BTC Campus. The creative educational programme, which has been organised for a fourth year in a row in BTC City Ljubljana, and which has seen its premiere this year in BTC City Murska Sobota, is intended for all young people seeking their first employment. Testifying to the importance of such educational courses and encouragements for the young people are stories and impressions of past BTC Campus participants. The BTC Campus participants concluded their programme enriched with plenty new experience, knowledge and convictions. During the course they tackled different taboos and came into contact with new views and challenges. Many say that this programme really opened their eyes and that they have walked the wrong career path in the past. Nowadays, employers are not only seeking for educated, but even more so for creative, hard-working and reliable employees who possess practical knowledge and are able to solve problems. They found especially encouraging the realisation that they do not need money for the majority of project ideas and that the so-called multitasking and self-initiative are key in building the career path of every individual. The words of Miss Maja Kovač from the MOL Company have carried a lot of weight with them, as she emphasised during one of the courses that the employer is actually a buyer, while employment-seekers are sellers. Without a doubt they will also remember the words of the President of the BTC Management Board, Jože Mermal, who surprised the participants with his visit on April fool’s Day and offered them a real-life business meeting. “Walk around with eyes wide open and always be aware that we are all teachers and students. At the same time, always believe in yourself and never give up”, was the advice of Mr Mermal, who has successfully managed the BTC Company for the last 23 years. 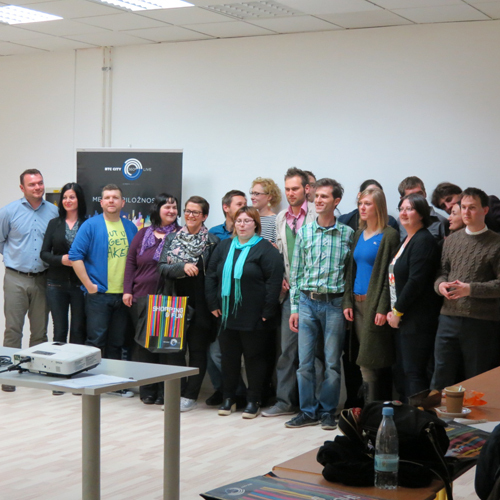 The response to the workshop was mostly positive: “The BTC Campus is the best that has ever happened to the Prekmurje region – well, maybe apart from the Slovenia’s got talent show – and I am proud and happy to be a part of this event”; “The BTC Campus represents a milestone for me, since I began to think differently, as lecturers presented us with new perspectives which we now know how to take advantage of. We need to learn how to seek opportunities and make way for our careers”. How important the workshop was for all the young employment-seekers and what this type of programme represents for Pomurje, a region strongly pestered with a high level of unemployment, was perfectly summed up by Miss Mavricija Batič, Director General of the Employment Service of Slovenia in her thank-you letter. There were plenty of AhA effects which introduced new perspectives and new knowledge to young people. At the conclusion of the course, we wish them lots of positivity and self-esteem in creating and developing their own career paths. It is true that the young form the world today; that is why the BTC Company has committed itself to continue supporting and encouraging socially responsible projects which promise a better future for the young people.